Södra Teatern (Southern Theatre) located in Stockholm’s lively and creative Söder district, is one of Sweden’s best known privately run theatres and the oldest such venue in Stockholm, established in 1859. A Robe LEDWash installation is another facility that can be offered in addition to its seven stages, two restaurants, outdoor terrace and fabulous panoramic views across the city. The theatre’s action-packed programme of events focuses on live music and performance and stages up to 1000 events over an average year. The newest Robe fixtures in the house are six LEDWash 600s and four LEDWash 300s, which were specified by head of lighting Lars Ekdahl, as part of a general lighting upgrade. The first Robe fixtures in the venue were ColorSpot and ColorWash 575E ATs, purchased ten years ago – and still working well today - so they already knew from experience that the reliability of the brand was good. Toivo Söderberg, from Robe’s distributors Bellalite, demonstrated the LEDWash products to Ekjahl, who was struck with the bright output, smooth colour mixing, theatrical grade dimming curve and small size of the LEDWashes. The low power consumption was another bonus, and he reckons that LED fixtures will figure prominently throughout the venue in the near future for all the long term cost saving benefits they can bring, as well as the great performance. The LEDWashes are in constant use, and can be moved between the different auditoriums in the Södra Teatern. Currently the 600s are in the main hall – where there is a choice of 40 house stage bars on an electronic winch system - and the 300s are rigged on one of the smaller live band stages. "They are great multi-purpose units," says Ekjahl, "The silent running is ideal for all our spoken word and stand-up comedy shows, while the power and intensity is just as appropriate for using to light loud rock bands or dance acts!" 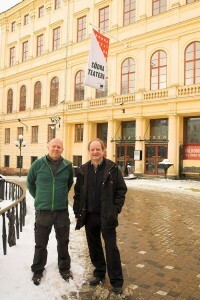 In picture: Södra Teatern’s head of lighting Lars Ekdahl with Toivo Söderberg from Robe’s Swedish distributor, Bellalite AB.